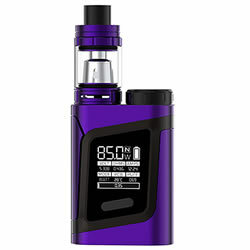 SMOK ALIEN AL85 - PURPLE BLACKFULL kit buy from NUCIG UK. Choose Your Free Eliquid Gift ! Tobacco GREEN Lable 70VG/30PG 18MG Tobacco GREEN Lable 70VG/30PG 12MG Tobacco GREEN Lable 70VG/30PG NICOTINE FREE Menthol GREEN Lable 70VG/30PG 18MG Menthol GREEN Lable 70VG/30PG 6MG Menthol GREEN Lable 70VG/30PG NICOTINE FREE No Thanks. The Alien Mini AL85 Vape Kit by Smok is a Vape kit that integrates the AL85 Box mod and TFV8 Baby Beast Tank. The AL85 Box Mod features maximum output power of 85W with wide temperature control range, minimum firing resistance of 0.1ohm for wattage mode and 0.06ohm for TC mode, integrated firing bar, and "+/-" button integrated within its OLED screen. The TFV8 Baby Beast tank features, Top Filling System, Adjustable Airflow control ring, 2ml capacity. This is a precision well engineered vape kit. The colour range possible is amazing - I chose purple and is superb. Easy to change coils and dissemble to clean the tank - well impressed! Will tell my family and friends where to go.